The surgery treats severe obesity. A calculation called body mass index ( BMI ) is used to determine how overweight or obese you are. A normal BMI is 18.5-25. Talk to your doctor about your medications, herbs, and dietary supplements. You may be asked to stop taking some medications up to one week before the procedure. Do not start taking any new medications, herbs, or supplements without talking to your doctor. Arrange for help at home as you recover. You may be asked to take antibiotics before coming to the hospital. You may be asked to take laxatives and/or do an enema to clear your intestines. The night before your surgery, eat a light meal. Do not eat or drink anything after midnight unless told otherwise by your doctor. Shower or bathe the morning of your surgery. To prepare you for surgery, an IV will be placed in your arm. You will receive fluids and medications through this line during the procedure. A breathing tube will be placed through your mouth and into your throat. This will help you breathe during surgery. You will also have a catheter placed in your bladder to drain urine. An 8-10 inch incision will be made to open the abdomen. Surgical staples will be used to create a small pouch at the top of your stomach. This pouch, which can hold about 1 cup of food, will be your new, smaller stomach. A normal stomach can hold 4-6 cups of food. Next, the small intestine will be cut and attached to the new pouch. 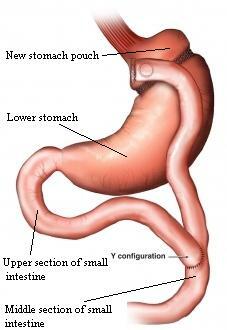 With the intestinal bypass, food will now move from the new stomach pouch to the middle section of the small intestine. It will skip the lower stomach and the upper section of the small intestine. Finally, the upper section of the small intestine will be attached to the middle section of the small intestine. This will allow fluid that the lower stomach makes to move down the upper section of the small intestine and into the middle section. When the bypass is completed, the incisions will be closed with staples or stitches. You will be taken to the recovery area for monitoring. You will also be given pain medication. The usual length of stay is 2-5 days. Your doctor may choose to keep you longer if complications arise. Pain medication will be given as needed. On the day of surgery—You will not be given food or drinks. On the day after surgery—You will have an x-ray of the upper GI tract to check for leaks from the stomach pouch. For this test, you will drink a special liquid while x-rays are taken. If the x-ray is normal, you will be given 30 milliliters (mL) of liquids every 20 minutes. If leaks are found, you will receive nutrition through an IV until the leaks are fixed. On the second day after surgery—You will take 1-2 tablespoons of pureed food or 1-2 ounces of liquids every 20 minutes. Use an incentive spirometer to help you take deep breaths. This helps prevent lung problems. Wear elastic surgical stockings or boots to promote blood flow in your legs. Get up and walk daily. Do not lift anything heavy until your doctor tells you it is safe. This may be up 2 weeks or more. You may have emotional changes after this surgery. Your doctor may refer you to a therapist. You will begin with 4-6 meals per day. A meal is two ounces of food. For the first 4-6 weeks after surgery, all food must be pureed. When you move to solid foods, they must be chewed well. When making food choices, you will need to consume enough protein. Avoid sweets and fatty foods. Eating too much or too quickly can cause vomiting or intense pain under your breastbone. Most people quickly learn how much food they can eat. Bariatric surgery. EBSCO DynaMed Plus website. Available at: http://www.dynamed.com/topics/dmp~AN~T483434/Bariatric-surgery . Updated October 23, 2017. Accessed December 22, 2017. Bariatric surgery. Merck Manual Professional Version website. Available at: http://www.merckmanuals.com/professional/nutritional-disorders/obesity-and-the-metabolic-syndrome/bariatric-surgery. Updated December 2016. Accessed December 22, 2017. Bariatric surgery. National Institute of Diabetes and Digestive and Kidney Diseases website. Available at: https://www.niddk.nih.gov/health-information/weight-management/bariatric-surgery. Accessed December 22, 2017. Maciejewski ML, Livingston EH, Smith VA, et al. Survival among high-risk patients after bariatric surgery. JAMA. 2011;305(23):2419-2426. Obesity surgery: Roux-en-Y gastric bypass. Cleveland Clinic website. Available at: https://my.clevelandclinic.org/health/treatments/17285-obesity-surgery/roux-en-y-gastric-bypass. Accessed December 22, 2017. Roux-en-Y gastric bypass. Columbia University Medical Center website. Available at: http://columbiasurgery.org/conditions-and-treatments/gastric-bypass-surgery. Accessed December 22, 2017. Roux-en-Y gastric bypass weight-loss surgery. Johns Hopkins Medicine website. Available at: https://www.hopkinsmedicine.org/healthlibrary/test%5Fprocedures/gastroenterology/roux-en-y%5Fgastric%5Fbypass%5Fweight-loss%5Fsurgery%5F135,65. Accessed December 22, 2017. 9/2/2009 DynaMed Plus Systematic Literature Surveillance http://www.dynamed.com/topics/dmp~AN~T483434/Bariatric-surgery : The Longitudinal Assessment of Bariatric Surgery (LABS) Consortium. Perioperative safety in the longitudinal assessment of bariatric surgery. N Engl J Med. 2009;361(5):445-454. 6/24/2011 DynaMed Plus Systematic Literature Surveillance http://www.dynamed.com/topics/dmp~AN~T483434/Bariatric-surgery : Pontiroli AE, Morabito A. Long-term prevention of mortality in morbid obesity through bariatric surgery. a systematic review and meta-analysis of trials performed with gastric banding and gastric bypass. Ann Surg. 2011;253(3):484-487.